The Mayor and Board of Aldermen meet the first and third Tuesdays of each month at the City of Amory City Hall for monthly Board Meetings. Check this website for information on upcoming events at the meetings and news about time and date changes. 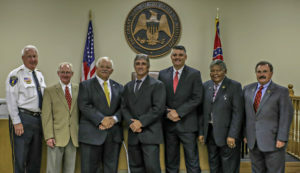 Left to Right: Police Chief Ronnie Bowen, Alderman Glen Bingham (Ward 4), Alderman William “Buddy” Carlisle (Ward 1), Alderman Joe McGonagill (Alderman at Large), Mayor Brad Blalock, Alderman John Darden (Ward 2), and Alderman Tony Poss (Ward 3). 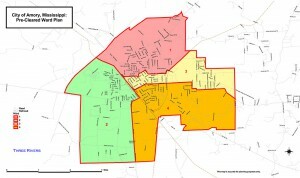 Not sure who your alderman is, or in which ward you reside? Click the map to find out (requires Adobe Reader or equivalent PDF reader).